Do you want strong abdominal muscles, as well as shapely arms and shoulders? If so, then you may want to give the Peacock posture a try. Not only will it work your abdominal muscles, but it will exercise your arms and shoulders as well. The Peacock is a yoga pose. All yoga emphasizes natural movement, and is often based on the movement of animals. This posture demands great strength and flexibility, particularly in the wrists. Although it is an intermediate to advanced exercise, with practice and patience, anyone can do it. I actually came across this article on Harold Rosen, who is literally a rocket scientist. He helped design the first geosynchronous satellite, and is currently working on the Google X Prize in his retirement. What does he do to stay in shape (his goal is to break the 100 meter dash record for 100 year olds!) Well, he does yoga poses like the Peacock! This is a picture of him below. 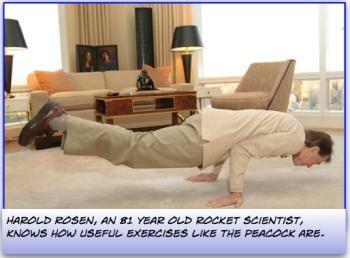 If an 81 year old man can do this, I think you can too! Support your body on the floor, with your hands directly under your shoulders and your knees directly under your hips; keep your back straight and parallel to the floor. Bend your arms, touching your forehead to the floor. Move your hands so that your fingers face your toes and your palms touch the floor; bend your elbows toward your abdominal muscles, trying to place your elbows below your navel and as close to your pubic bone as you can. Push with your bent legs to move some of your weight forward toward your shoulders and take some of the tension off your wrists. As you shift your weight forward, you will begin to balance, with your hands, wrists, and forearms supporting more and more of your weight. Lift your head, and support yourself on your forearms; straighten your legs completely, and rest on your toes and your hands; direct your vision forward. Continue shifting your weight forward, and try to lift your feet off the floor as you balance your entire body parallel to the floor. You must tighten your abdominal muscles, and use your back and arm muscles to hold this pose. If you find this too difficult on your wrists, you can turn your hands slightly outward with your fingers pointing to the sides rather than pointing at your toes. Hold this position for five very slow, deep breaths. Lower your legs to the ground, bend your knees, sit back into a kneeling posture, and shake out your wrists a bit to release the tension; exhale, and relax.